Well, we’re back from our break with a Mrs. Columbo. Before you hit us, though, wait! 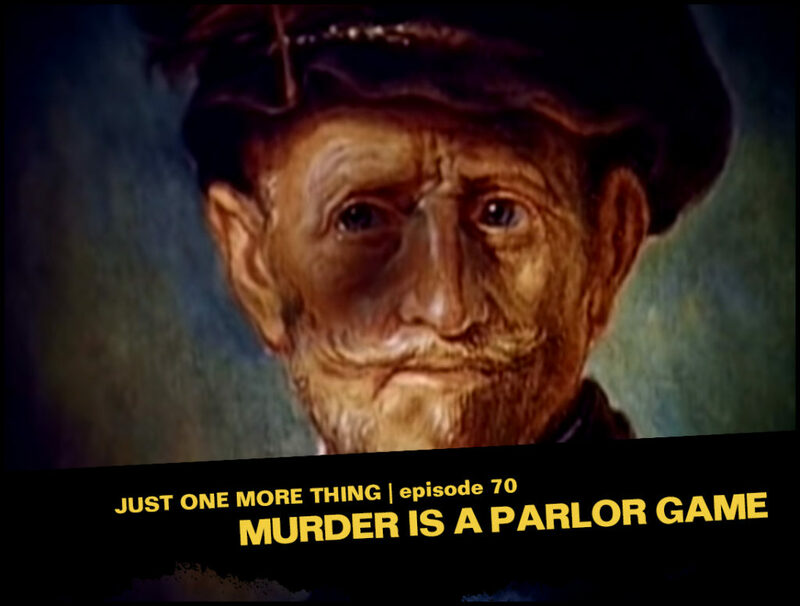 “Murder is a Parlor Game” stars Donald Pleasance! That must mean it’s good, right? Right? Nope! Go ahead and hit away! In this episode, Pleasance plays a retired Scotland Yard detective who lives in the Wee Britain section of LA, an acclaimed true-crime author and sometime instructor in women’s self-defense. When a wrongly-accused suspect from a past case comes back to haunt him, there’s a struggle, a gunshot and one of the sorriest attempts of a crime scene coverup in recorded modern history. Will Mrs. Columbo piece it together, working the weekly penny saver beat? No, not really! She just sort of stumbles upon things while snooping around and… oh, just watch the thing or listen to us. Back again are writers Jennifer Wright (Harper’s Bazaar, Get Well Soon: History’s Worst Plagues and the Heroes Who Fought Them) and Daniel Kibblesmith (Late Show with Stephen Colbert) with ideas to fix the show, a killer Owen Wilson impression, the “Mrs. Columbo is Dumb” theory, and a free name for your ska band. ALSO- Viewer Mail, with tech tips, analogues to The Wire and speculation about the future of this very podcast. In Indiana Jones and the Temple of Doom, Indy’s sidekick is named Short Round. I remember this because the script repeatedly goes to great lengths to point this out. Even on a first viewing, this was strange and distracting. It doesn’t reveal anything about the character; it doesn’t advance the plot; it’s not funny or clever. Yet we are told, again and again, that he is named Short Round. It was a head-scratcher. As for the rest of “Parlor Game”: you covered most of the major points in the podcast, but I’d like to add that one of the things that makes the show virtually unwatchable is how it fawns over its main character. Kate is insufferably cheerful and upbeat. She’s written and filmed to make her the star of every situation she encounters: for example, did she really have to be pulled onstage at the magic show? Even the (intrusive, syrupy) soundtrack is used to pound you over the head with how gosh-darned adorable she is. This all suggests that the producers had no faith in Mulgrew’s or the writers’ ability to get the audience to care about Kate, so they resorted to all this cheap prompting. Well, just a few episodes left to go. I am looking forward to them. Therefore, to be possess’d with double pomp,To guard a title that was rich before,To gild refined gold, to paint the lily,To throw a perfume on the violet,To smooth the ice, or add another hueUnto the rainbow, or with taper-lightTo seek the beauteous eye of heaven to garnish,Is wasteful and ridiculous excess. You wanna start writing our show notes (for the next three episodes)? Because you’re doing a bang-up job! Just watched “Any Old Port In A Storm”, and liked Donald Pleasance’s performance in that, but jee.. he’s so over-the-top in this Mrs. Columbo episode. I really missed your podcast, it was a joy listening to, and the story of the alleged cat burglary was hilarious! What doomed Mrs. Columbo for me from the start was the casting of Kate Mulgrew. Kate Mulgrew had nothing in common with the picture of Mrs. Columbo I had in my head, from her husband’s various references in the original Columbo series. She was too young, insufficiently ethnic, no large extended family, etc., etc. Someone like Linda Lavin (who unfortunately was in the middle of “Alice” at the time) would have been much, much better. Great episode as ever. Be interestibgbto look at a later one that doesn’t lean on the Columbo nods so much (or at all). For the follow up podcast? Well, the Bilko idea would be superb. A personal suggestion? Touches on crime, but also comics, but set far enough back to have social discussions? I think you guys hit the nail on the head with the murderer just not having the noblesse or even the arrogance of the typical Columbo villain. Morley was just such a bumbling baffoon who was hand-wringing and literally frightened by Mrs. Columbo from moment one (the script never bothers to answer why in any rational way) that the usual slick and cool hallmark of the murderer isn’t there. And it compromises the character. Pleasance did Pleasance (and a Columbo murderer) right in the Wine Episode. This only logically works as farce—and even then it still stinks. And if Jon’s antibody theory is to work here, Columbo killed the Morley show in its PILOT. Him puttering around in his garden and writing books doesn’t stretch into a second episode. This thing was mercifully innoculated in pilot status. Did you intend to delete the previous post, the one that announced “Murder Is a Parlor Game”? No, that was accidental. It’s back.